The Clarksville Montgomery County School System (CMCSS) in Tennessee has been using the A+nyWhere Learning System® (A+LS™) courseware from American Education Corporation since 2003. CMCSS uses A+LS in its Alternative School, Virtual School, Credit Recovery, and Summer Intervention programs, and also for ACT and GED preparation. The results of Sucharski’s strategies are well documented. 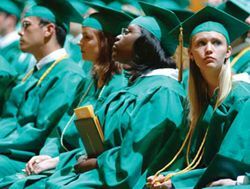 “For instance,” says Sucharski, “100 percent of the students coming to our Virtual High Schools were identified as being unable to graduate on time in their traditional high school programs. In the last two years, 90 percent of Virtual School students graduated high school on time with regular diplomas—that’s a huge percentage.” And in the CMCSS Credit Recovery Program, 93 percent of more than 200 students recovered their credits.